As for me, I love my two Instant pots (6-quart duo and 3-quart mini) and use them daily without fail. Personally, I have never had pressure cooker anxiety because I started using the Kuhn Rikon stove top pressure cookers over twenty years ago. That being said, I can understand why some people hesitate. There are lots of buttons, The manual isn’t great. And, once you lock and load, commit to pressure and things start to rumble. there’s no turning back and you can’t open the lid and check the contents. It is indeed a leap of faith. My solution for those folks who fret? Take the Instant pot out of the box, run the simple water test per the manufacturer’s instructions and make YOGURT! Both of my machines have yogurt buttons and this cycle does NOT require putting anything under pressure. It simply creates a low heat that incubates your milk and starter and turns it into the rich luscious yogurt over the course of 8 hours. A miracle cycle in my mind! I’ve tried various yogurt recipes but my favorites have come from This Old Gal and the only recipe I use now is her Instant Pot No Boil Yogurt Recipe which uses the whole Fairlife Milk found in many mainstream grocery stores such as Target, Safeway, QFC, and Winco. This particular milk does not require any preheating before making the yogurt so all I have to do is pour my half a gallon of whole milk into my 3 quart Instant Pot and whisk in two packets of YoGourmet starter. I then put on the lid, press the Yogurt Cycle and leave it alone for 8 hours. There is no pressure. No noise. No steam. No wiggles or jiggles. Just a quiet incubation on the counter. At the end of the cycle, the mixture has transformed into thick luscious creaminess. I then put my all natural yogurt, still in the Instant Pot’s inner container, into my fridge, covered and let it sit, undisturbed, overnight. I use my yogurt on everything from granola and citrus segments to baked potatoes and kale salads. And, I’ve discovered that it makes a great tartar sauce to dollop on Alaska halibut or salmon. So, if you want to buy an Instant Pot but are feeling, well, pressured…skip “manual” button and go for Yogurt. Even if you never make anything else, the savings from making your own yogurt will pay for the pot in no time. I grew up on Long Island and have vivid memories of how much my father hated the month of January. It was always a cold, dark, and dreary month. The fun and festivities of the holidays were over and it was time to shed those excess pounds. My dad used to commute on the Long Island Railroad from our suburban home into New York City each day. My father and I have always been early birds, so each cold and often snowy morning during the month of January, I’d watch my dad start his day with a grapefruit. I often silently wondered if my dad was tucking into those juicy ruby reds as a way to add a little sunshine to the day ahead. I really suspect that he was! My dad always ate his aromatic grapefruit in the same way. He’d cut it in half along the “equator” and then use his trusty vintage grapefruit knife in order to carefully segment the juicy fruit inside. Sometimes, he’d use a grapefruit spoon to scoop up the segments or he’d just make do with a regular spoon. I don’t have a grapefruit knife or a grapefruit spoon in my kitchen, but I think I might be adding one soon. Both tools certainly make it easy to get a delicious dose of sunshine! If you are a grapefruit fan, do you use a grapefruit knife or spoon? Seattle’s mild maritime climate allows me to have a wonderful winter garden each year. This Arctic Butterhead always survives the winter and springs to life in the spring. The slugs love to hide in the crevices so it’s important to wash it WELL! Without a doubt, a bountiful garden is indeed an awesome way to control the family food budget. But, I know from my own kitchen garden experience, that a garden glut can easily overwhelm the cook. It’s a pleasure to have lots of fresh homegrown vegetables to work with, but if you don’t know how to prepare them quickly and efficiently, all of your green thumb effort will be pitched right back into the compost heap when the items deteriorate in the fridge. With that in mind, I am going to discuss how to wash and dry homegrown lettuces, greens, and spinach. Although organic mesclun mixes are widely available in produce departments, lettuces are some of the easiest and more rewarding things to grow. 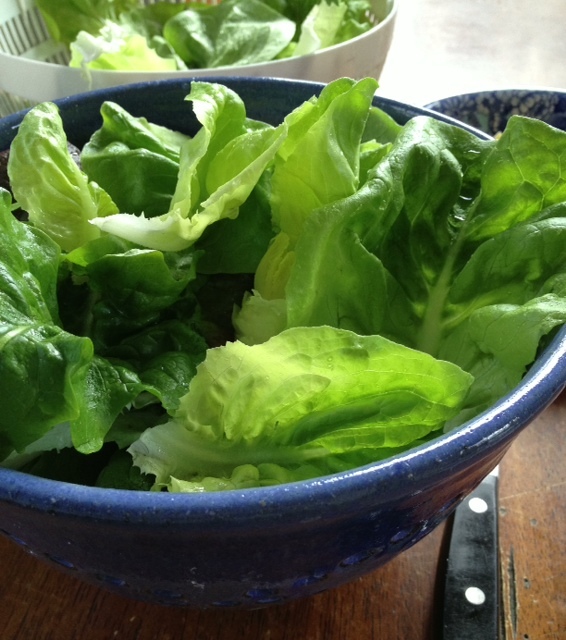 The supermarket lettuce mixes can’t compare to a diverse selection of homegrown greens destined for the salad bowl. And, of course, freshness is unsurpassed. It’s well known that slugs and grit take refuge in the leaves’ crevices, so the greens need to be washed properly. Cleaning is generally done by plunging the greens into a bowl of cold water, swishing them gently, removing them and pouring off the dirty water. It can take a few rounds to completely remove the grit and slugs, and once the lettuce is clean it needs to be dried properly so you don’t have a soggy salad once dressed. Kitchen towels can work, but the best tool for the task is a salad spinner. Both the rinsing and drying can be done in the spinner, so the task is simplified. I like the Oxo Good Grips Salad Spinner. The three piece dishwasher safe device has a bowl, a perforated basket, and a lid with a non slip knob. It’s easy create the drying centrifugal force by pumping the large knob on the lid. The patented pump mechanism features a brake button that quickly stops the spinning process. The large spinner has a bowl capacity of 6.22 quarts. The mini spinner is suitable for small families and for drying fresh herbs. So, getting to the root of things, it’s obvious that having the right tool can put a whole new spin on dinner! This blog post originally appeared on Amazon’s Al Dente blog in May 2009.